We are 100% locally owned-and-operated in Brentwood, Tennessee. We service Belle Meade, Bellevue, Berry Hill, Brentwood, Crieve Hall, Forest Hills, Franklin, Green Hills, Melrose, Nolensville, Oak Hill, Sylvan Park, West Meade, East Nashville, Spring Hill, Thompson’s Station. Our programs incorporate organic-based materials and the latest in turf care products for excellent results. For your convenience, all of our services are performed on a continual basis. We never require contracts—but please let us know by email if you would like to make any changes or cancel your lawn care plan. The Pure Turf Fertilization and Weed Control Program consists of seven annual treatments that are built around a complete lineup of premium fertilizers, weed control products, biostimulants, and other specialty products. We incorporate both organic-based materials and the latest advancements in turf care technologies. 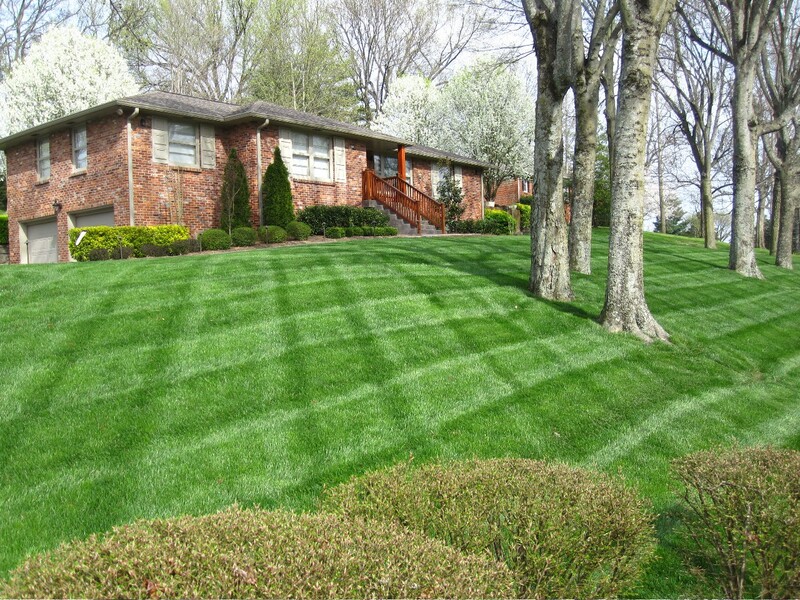 This hybrid approach to turf care builds a safer, healthier lawn for you and your family to enjoy. Liquid pre-emergent to prevent crabgrass and other grassy weeds from germinating. Post-emergent spray to control winter weeds in cool weather. Fertilization to promote an early green-up and to feed your lawn throughout the spring. This fertilizer is specifically formulated for cool weather. The pre-emergent must be activated by 1/2 inch of rain or irrigation. This allows the pre-emergent to be washed down into the soil where it can become active. Controlled release fertilization to provide consistent color throughout the spring. This premium fertilizer uses technology that helps protect against leaching, denitrification and volatilization – allowing time for nitrogen to move into the root zone and stay there longer. Additional pre-emergent applied to prevent crabgrass and other grassy weeds from germinating. Post-emergent weed control for broadleaf weeds. Late season pre-emergent application, extending protection into the summer months. Post-emergent weed control for broadleaf weeds, early stage crabgrass and yellow nutsedge. Optional fungicide applications start at this time. Follow proper irrigation guidelines to reduce disease development. 100% organic biostimulant that enhances fertilizer performance, increasing the availability of micro-nutrients to the plant. This will naturally improve plant health. Post-emergent weed control for broadleaf weeds as needed. Nutsedge and crabgrass control as needed. Optional fungicide application. Follow proper irrigation guidelines to reduce disease development. Post emergent control of broadleaf weeds, crabgrass and other grassy weeds. This treatment provides a final weed cleanup before the seeding process begins. It’s the perfect treatment for lawns just prior to aeration and seeding. This granular application is organic based fertilizer blend of humates and composted poultry manure. It’s incredible fuel for your soil and will promote seed germination and root development in your new seedlings. Lawns we do not seed will receive our custom liquid fertilizer application. It is extremely important to aerate and over-seed at this time. It is the single most important step in the turf management process, and without it, your lawn will not reach its’ full potential. We use premium quality seed blends. Controlled release fertilization to provide consistent color into the winter months. This premium fertilizer uses technology that helps protect against leaching, denitrification and volatilization – allowing time for nitrogen to move into the root zone and stay there longer. Post-emergent broadleaf weed control specially formulated for cool weather. How do we get and keep a beautiful lawn? The combination of a quality aeration and a premium seed blend is the secret sauce of a beautiful fescue lawn. Aeration de-compacts the soil, improving the infiltration of oxygen, water and nutrients; it promotes root growth and also provides an excellent environment for seed germination. We use seed varieties that are bred to better handle the heat and disease pressures that are common in Middle Tennessee. If you have the ability to irrigate after seeding, we recommend lightly doing so 2-3 times per day for 2-3 weeks, or until the new seedlings are established. Then resume a normal (2-3 days per week) irrigation schedule. A beautiful lawn can quickly be destroyed. A beautiful lawn can quickly be destroyed by Brown patch, which is a serious fungal disease, that can affect all cool season grass. Conditions that encourage the development of the disease begin when there is high humidity and when nightly temperatures exceed 60˚F. This causes an extended period of “leaf wetness.” Typically, this happens during mid-May in Middle Tennessee. Our preventative disease program includes 3 treatments starting in mid-May. Treatments are 28 days apart so that the protection lasts throughout the summer. In addition to the fungicide program, here are some good lawn care practices that can be very effective at preventing/reducing disease pressure. Irrigate only as needed (never more than 2-3 times per week) during the early morning hours. Never water in the late afternoon or at night. Provide adequate drainage for all lawn areas. Correct soil compaction with core aeration. Over-seed your lawn each fall with the highest-quality disease-resistant cultivars available. All of the seed we use must meet this criteria. Keep lawns mowed on a regular basis at 3.5-4 inches in height. Mowing any lower than optimum height can increase disease severity. We have two options to choose from when it comes to insect control. The first question we usually get is “Which one works better?” The truth is that we’ve had great results with both. The synthetic product is going to have a slightly faster knock-down power and is really good if you have a heavy tick infestation. The natural product is excellent for many insects, including mosquitoes, and couldn’t be any safer. Cost per application is the same for each option. This treatment is safe for your lawn, landscape and outdoor living areas. We do ask that you stay off the treated areas until they are dry. The first 2 treatments will be applied about 2 weeks apart to establish a base barrier. After that, the treatments will be monthly. This natural oil-based product is safe for children, pets, birds, fish, amphibians and pollinating & beneficial insects. It’s also safe to spray in small ponds or any standing water. This product controls mosquitoes, fleas, ticks, chiggers, no-seeums, mites, ants, termites and many, many more. It works by causing pheromone interruption and dehydration in insects and their larvae and eggs. Children and pets do NOT have to leave the area during or after treatment. The life round of insects is very short…so stopping their reproduction is the key to success. Mosquite Control Tips - Let us Help You!